Set in the fabulous grounds of an exclusive 5 star resort (voted top 5 Thai resorts by Conde Naste and No. 2 Coolest bar in the world by CNN in 2012) on the beautiful southern-most tip of Phuket, this stunning Mediterranean-style villa boasts panoramic sea and island views, a private beach, four infinity-edge swimming pools and easy access to nearby sheltered bays and coves. Ideal for families or couples with three full-time staff (a superb cook, housekeeper and gardener) to ensure your stay is as enjoyable and relaxing as you could wish for. A pool table, fusball table, fully equipped gym and two tennis courts to cater for the energetic and an exclusive spa for those seeking relaxation and rejuvenation. Four beautifully furnished and fully equipped double bedrooms, all with extended decks and drop-dead gorgeous views opening up to the sea below. The villa and resort are truly stunning, boasting unrivalled views to the nearby islands, sensational sunsets, five star service and facilities. An ultra-cool bar is the place to watch the sun go down whilst sipping a long drink and dipping your toes in the infinity pool. Frequented by royalty, movie stars and business leaders, the resort boasts such a full range of facilities you might not leave it. Harper's Bazaar Travel Guide said it has 'every amenity you could wish for'. To list a few; private beach, 3 world-class restaurants (Gordon Ramsey commented 'the chefs are a class act and would be a huge success in London') a luxury spa, easy access to secluded white sand beaches with warm turqoise waters, a beach bar, nightclub, cooking school, tennis courts and fully equiped gym. We offer our guests preferential rates for use of our 7 seat Toyota Fortuna SUV during their stay to ensure they get the most from their time with us. Every year our list of returning guests grows longer as do the complimentary reviews. Come and see for yourself! We were looking for something a little bit different from your typical Thai villa, and, after a long search, we found exactly what we were looking for. Mediterranean in styling with generous proportions, masses of deck space, luxurious finishings and simply stunning views out to the islands, The sea breaks on the sand directly below us providing an endless and soothing backdrop to sooth away those tensions and stresses of everyday life. As our 'home from home' we have equipped and furnished the villa to the very highest standards, complete with stunning art pieces and those little touches that mark it out from the norm. As part of the resort, our guests have use of the many fantastic facilities within the resort, including three addtional swimming pools, gym, tennis courts, spa, restaurants and bars, all within a few minutes walk. Our three full-time staff will cater for your washing and laundry and can prepare mouthwatering dishes for breakfast/lunch/dinner. The head housekeeper is an excellent cook, equally adept with Thai or western dishes. We never go out to eat Thai food as we think we get the best there is at home! They can be as involved or unobtrusive as you wish and can baby-sit if required. We recommend that you tip them at the end of your stay! My husband and I rented this villa along with another couple for 5 nights for rest and relaxation following a working trip. We were not disappointed. The property is exactly as advertised (actually, even better), and the experience was one that we will not soon forget. The staff were extremely attentive, but we still had privacy. The house caretaker and chef, Add, prepared the most delicious and beautiful Thai food that we have ever eaten. The house was very clean, well decorated and comfortable. Despite the fact that we stayed during an unseasonably warm week, the air conditioning system kept the rooms cool, which can be a challenge for most tropical locations. The resort in which the villa is located, Sri Panwa, was fantastic. We did not end up eating outside of the villa very much because Add's food was so incredible, but they had several restaurants and bars that were wonderful, especially the pool club bar. We also visited the spa, which was one of the most beautiful locations in the resort. Baba Nest is also located in the resort and definitely lives up to its designation as one of the most spectacular bars in the world with nearly 360 degree views of the sea and surrounding islands. We will be back as soon as possible! Thanks to Add, Marc, and Noi for an incredible stay! It was a pleasure to have you as our guests and I am delighted that Add and her team helped to make your stay so memorable. It was great to have the opportunity of meeting you all during our wonderful day out on 'Playlife' and we certainly look forward to seeing you again at Baan Panwa. We have been visiting Thailand for many years, and have come to learn 5 star is not always 5 star. This is however not the case with the Sri Panwa resort and this outstanding Villa. The experience begins with prompt professional communication with Marc the owner. Marc and his property manager Khun Noi arranged an airport transfer which was there to pick us up when we arrived at Phuket international airport. Once arriving at the villa, you are greeted by Khun Noi and all the lovely staff that work on site at the Villa. The fridge is full stocked with drinks and food, and the place is immaculate. Khun Noi ensures everything is as you require before leaving you to enjoy your holiday. Every day, the head house keeper cooked some of the most delicious Thai food we have ever and was always around making sure our stay was comfortable as well as always being on top of cleaning and general maintenance around the Villa. The resort also has its own private beach, swimming pool (in addition to your private one), games room, and baba bar and restaurant which I highly recommend for sunset cocktails. The pictures really don't do this place justice, its a secluded peace of luxury that needs to be experienced, especially if its a relaxing break you need. With every review I write, I like to give a negative, but on this occasion the only one I can think of, is the fact we had to leave! A big thankyou to Marc, Khun Noi and all the staff for making this a fantastic 7 nights for all of my family. This was truly a 5 star experience. I booked this villa with a couple of friends and their families. It was a special occasion so we wanted something memorable and we were not disappointed! From beginning to end this holiday was perfect. The owner was very helpful and always very prompt with any correspondence. The villa is set into the hillside and overlooks the beach and sea.It has 4 large, luxurious bedrooms that easily accommodated our party of 5 adults, 3 children and 1 baby. These are set around an infinity pool which, along with the pool table beside it, kept the children (and adults!) entertained for hours. We were extremely well looked after by the lovely staff which included a gardener and a cook. The food the cook prepared was absolutely gorgeous. It was always fresh and ready for when we had requested to eat. It is quite simply the best Thai food we have ever eaten! It was so easy to arrange as there was a booklet with a wide range of Thai dishes we could choose from. We simply ordered and the cook got the ingredients which we paid for towards the end of the holiday. She even cooked any western dishes we requested for the children - although they all enjoyed the Thai food too! There really is no need to leave the Villa apart from the fact that there is much more to see and do on the Sri Panwa estate. There are more swimming pools to explore, the private beach to visit, a games room that the children loved and sipping a cocktail in Baba's nest whilst the sun sets is an absolute must do! We think we even spotted a celebrity there!! Although the estate is set into a hillside, so therefore the roads are quite steep, it is very easy to get around via complimentary tuc-tucs. There is also a nice collection of restaurants/shops and bars down by the sea front that are worth a visit. It was an amazing holiday and would have no hesitations about recommending it to friends and family,the only problem is that the holiday was just too short! I'll try to make this review full of rich detail while keeping it brief. I was traveling with my girlfriend, family and family friends, a party of 10 people from Kiev to Phuket. The trip began with a 9 hour delay to the direct flight from Kiev to Bangkok, after finally arriving to Bangkok those 2 days we had there were nice but exhausting. The second we landed in Phuket, we had 2 minivan transfers arranged by the amazing Noi who is the villa director taking us to the Villa. From that point on it was nothing but excellent service, pure relaxation, and everything anyone could ever want from a vacation. Nestled on a mountain side with just a few minutes walk to a private beach and access to all of the amazing resort facilities that Sri Panwa has to offer. If you don't mind spending a few extra dollars on your vacation then this is definitely the place to be. 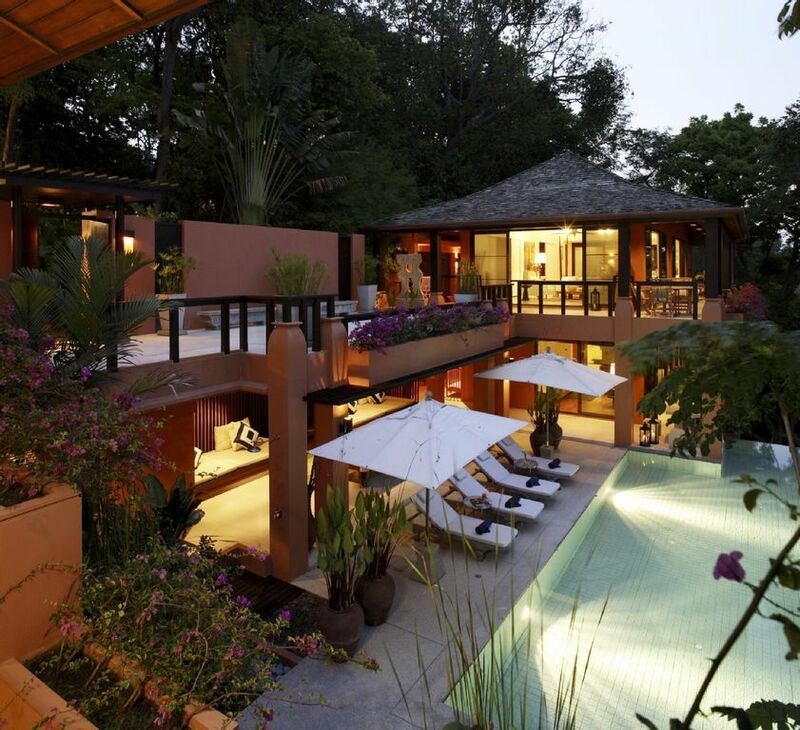 We booked this gorgeous villa at Sri Panwa Resort for 9 glorious days, after reading all the glowing reviews. They are all 100% correct. There is nothing to fault here, except having to leave. The tone of things to come was set from out initial contact with the owner, Marc. He was a delight to deal with. With 4 adults and kids ranging from 10-16 everyone had a marvelous time. The setting, the staff, the accommodation, the food, the facilities the list goes on….. there is not enough adjectives to describe the experience we had as it ticked all the boxes and then some. It was pure unadulterated luxury. Do yourself a favour and book it, as everyone deserves the memory and experience we had. Looking forward to our return. We have not long returned from spending eight nights at this wonderful villa. It looks good on the web site but frankly pictures alone can't begin to describe how great a place it is. The accommodation and setting are both first class set on the southern tip of Phuket on the Sri Panwa Resort, where we were able to use all the facilities of the resort in addition to the villa itself. At the villa the pool, dining area and bedrooms are wonderful and the villa itself has total privicy being surrounded on three sides by lush vegetation. The great thing about the villa however is probably not the villa itself but the staff who looked after our every need, cooking fantastic meals, either Thai or western and organising trips for us if we wanted to explore the island - quite an indulgent luxury which made the holiday something to remember. If you decide to book you won't be disappoined, and do take on some of the owners suggestions on places to eat and visit which were always spot on. One of Phuket's finest luxury villas set high on the Cape Panwa peninsula within the award winning Sri Panwa Resort with stunning panoramic views of the Andaman Sea and islands of Koh PiPi and Koh Lon. If you tire of the private beach there are a host to choose from within a 5 minute drive, and Phuket Town, with its fabulous local and international restaurants is just 15 minutes away. Boat trips to the surrounding islands and beaches leave from the bottom of our drive where you will also find great Thai and Indian food available. Baba, the award winning Restaurant and bar is literally steps from our villa. Two world class golf courses are within a 20 minute drive. Rates include use of our 7 seat Toyota SUV, complimentary pick up from and return to the airport. Meals can be prepared by the cook as required - simply inform her what you would like and give her the money to purchase the food. DISCOUNTS (only one to apply): Early bird discount: 10% if booking is confirmed more than 270 days before arrival. Long stay discount: 10% if booking is for 18 night.